"Thank you so very much," Hernando Carlos Kulez said into the microphone as quickly as he could, while the banquet room of the London Hilton filled with applause. Kulez was on stage to pick up the 1992 international Pulitzer for a series of compelling photographs of civilian casualties in the recent Gulf War. Throughout his career, the now middle-aged Chilean had worked hard to become one of the preeminent photojournalists of frontline world situations. Once the war had ended, he moved from covering the crisis in the Gulf to focus on the situation in Serbia. In London to receive the Pulitzer, Kulez kept wondering, "what am I doing here?" His firsthand experience observing the cruelties of war made him feel depressed, rather than deserving any acclaim. For having covered stories of devastating events in his native South America, he saw the deaths of thousands in the huge disasters he had photographed. But it didnt prepare him for the sheer inhumanity hed witnessed recently covering the terribly volatile conflict in Bosnia-Herzegovena. Returning to his seat, Hernando was pulled into a flashback memory that recurred for him day in and day out since four months ago when he took photographs of a terrorist Croatian firing squad killing innocent townspeople, including children. Whenever he heard loud and sudden noises, that evening almost every time there was a loud round of applause, he was hearing gunfire and re-seeing the senseless killing being played out in his consciousness. To his damaged emotional body, shell-shocked from recent events, it was just as if he were right there again, watching the horrific suffering. 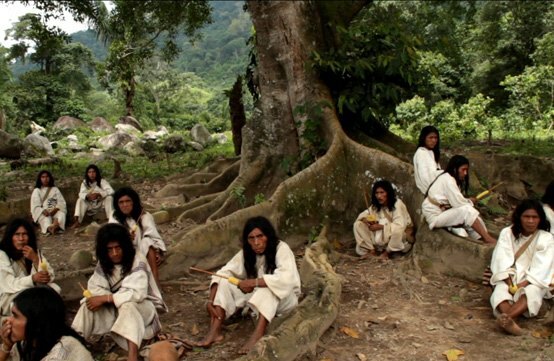 During the event's keynote speech, Hernando was pulled out of his trauma by a young British filmmaker who described the Mamos, priests of the Kogi Indians, who claim their home in the South American Sierra was once the Garden of Eden. "From this location, which they call the Heart of the Earth, all that they do in their civilization, every simple task, is done in a special way, in order to ensure health and fertility in the world. And after making this documentary on the Kogi, it just well may be true: theyre responsible for the fact that were still here today." Kulez recalled seeing this BBC documentary on the Kogi tribe a few months before. It had revealed to the world their ancient civilization. Something about their faces and expression had stirred Hernandos interest, and he remembered their compelling story. As Hernando tuned in, he didnt know whether it was his journalists instinct or his souls call for help that drew him to learn more about this pre-Colombian civilization and its people. After the devastating shock of the massacre of innocent people, the quiet simplicity of the Kogis lifestyle jumped out to beckon him to go there. Elder Brothers, the "Mamos" or shaman of the Kogi, believe their civilization to be the guardians of life on Earth. They hold the Earth as Aluna ~ Mother of all Life. Spiritual leaders for their tribe, the Mamos have maintained their ancient ceremonies over centuries always striving to balance the spiritual and material forces of nature, and in so doing, the actions of all humanity. If everything ~ every tree, every stone ~ has a Spirit, which the Kogi believe, then what kind of Spirit could possibly explain the brutality of the wars hed chronicled? Kulez kept asking himself this for next couple of days. Now that his post-traumatic nerves had brought an early end to his assignment in Eastern Europe, he was impelled to seek the healing of his debilitating condition. First thing to do: fly home to Chile and meet with his editors. Sitting on a hill in the highlands above Santiago, Kulez thought back to the Pulitzer awards banquet. Since leaving London a week before, he hadnt had another flashback episode. Taking this as a sign he was on the right track, he proposed to his editors that he'd bring back a human interest story if they sent him to photograph the Kogi. So with only a few personal items, cameras and film, he traveled by bus out of Bogota, and from the last busstop by burro to the Kogi town of Pueblo Viejo. Until the BBCs documentary, the Kogi had remained hidden to the rest of the world, where they continue to live under the disciplined rituals of their traditions. 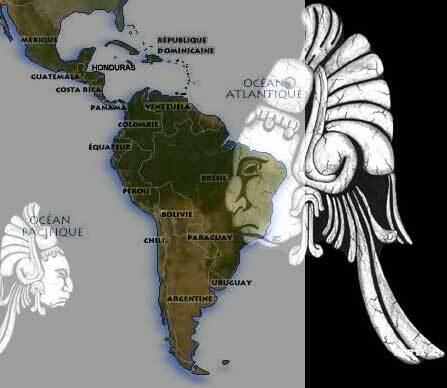 Following the Spanish conquest and with the growth of the modern world, their ancient prophecies hold that the Earths technological developments will bring catastrophe. For centuries they have also believed that they are tethered to the rest of civilization, and all the world will sooner or later be yanked to destruction. "Ive come to see the Mamos. I'm here because I want to learn from them," Hernando explained to the constable at the door of their meeting hall. The constable agreed to summons one of the Elder Brothers, who listened as Hernando explained that he had come to learn how they work through their spiritual practice to heal the world. Mamo Jefe listened to Hernandos request and agreed to take it to the Mamos meeting hall, the nuhue, to their assembly that evening. And he offered Hernando lodging in a small hut in the small village. That night at the nuhue, Mamo Jefe told the other priests of the request. As Kulez seemed full of pain and worry, many of them at first felt his request was intrusive. According to their custom, they consulted Aluna, great Mother of all, through their formal divination technique of tu-tuma ~ reading bubbles in a bowl of water. A hallow bead, the tuma, is dropped into the water, and the Mamos listen for the answer to come through the bubbles that surface. Indeed, what came through was out of the ordinary ~ instruction to bring their visitor to meet Elder Sister, the high priestess of the tribe, whose very presence is one of the guarded secrets of their religion. 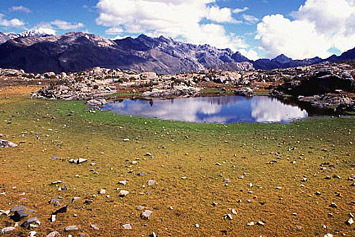 This would require journeying by foot high into the Sierra, to an elevation over 7,000 feet, where she lived and maintained the tribes high temple. There, Elder Sister's foremost duty was to raise and teach the chosen child who would replace her. This took 11 years, and during these years the child was not permitted to leave the temple in a cave. From birth, the priestss would be the only contact, the only human allowed to touch the child. The next day Mamo Jefe told Hernando that he would be escorting him to the mountain temple, to meet Elder Sister. 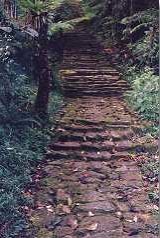 They arrived two days later, and from the grueling climb and high elevation Hernando had become weak, with a high fever. Mamo Jefe wrapped him for the night, and while asleep, Hernando had a most vivid dream. In the dream, Kulez saw himself inside the cave, and he first noticed a young Kogi child, who pointed to the center of the temple, where the light was so bright it nearly blinded Hernando. This light emanated from a spectacular object, and he saw that it was a mineral, in crystal form, glowing with electric blue-green luminescence. He was impelled to look at it, and as he did, Hernando felt the radiating energy from the crystal enter his body. Immediately he was transformed somehow knew he was healed from the post traumatic stress effects. Then the next thing he knew, he was outside the temple and somehow found himself holding the incredible crystal above his head, with both hands. When Kulez woke up, the fever had indeed broken, and Mamo Jefe was sitting next to him. "You can bathe at a creek nearby," he showed Hernando. "And then we shall go to the temple." There was a secret prophecy handed down to Elder Sister when she was in training by her own mentor to take over as the high leader of the Kogi, many years ago, that told of a Younger Brother who would come in the future and would ask for help, and who was really coming there to help the world. Three years ago, when the BBC had come to tape, she'd wondered if they might have been the fulfillment of that prophecy. But the tu-tuma beads never told the Mamos it was any of the crew. As for Kulez, the tuma at the Mamos' meeting had sent bubbles rising high above the water and whispered it was right to take Hernando to meet Elder Sister. Now, as he followed Mamo Jefe into the cave, Kulez recognized its interior from his dream. There was no child in sight, but once again the first thing he noticed was the shining blue-green crystal. And once again, its radiant energy captivated him. Ever the frontline journalist, Hernando went to do what was instinctual from his many years covering the war: "get the photograph." And before the high priestess even began to comprehend any of what was happening, he reached into his pocket for his camera. As Elder Sister registered the horror Hernando had around him from his recent war experiences, she was frozen. Having never seen a camera before, she watched as Kulez raised the black metallic rectangular box to his head. Instantly concerned for the powerful crystal, which she knew to be unstable, she held up her hand to Hernando, beginning to wave it as a warning of the crystals power. But he snapped the photograph, and in a brief moment, the reflection of the flash ricocheted from the crystal into the open palm of her hand. The jarring impact was so incredibly intense, she fell instantaneously to the ground. Mamo Jefe, who had seen cameras when the BBC were filming and recognized the flash, observed the whole encounter, and was whacked by the suddenness of the interplay hed just seen. He knew immediately that the force of the crystal had amplified the energy released by the flash and had overwhelmed her, for Elder Sisters connection to the sacred stone was extremely close. The two men tried to revive her, and Mamo Jefe worked together with Kulez by his side ~ both were fully mobilized to action. All in the same situation awed by the tragedy he had unwittingly caused, Hernandos focus went to the task of trying to undo his impetuous action. But their efforts at resuscitation were futile, her heartbeat stopped and she was no longer breathing. Hernando stumbled outside into the light, sat down and tried to get still, looking over the valley below. Now that he was no longer engaged in the task of trying to revive the woman, he was pulled back into his old familiar place of despair. Recalling the horror of the atrocities he had witnessed in Serbia, he effectively had killed Elder Sister, whose sacred ways hed come there to study and learn. *** Mamo Jefe, who had felt Hernandos sincerity, saw the ironic consequence of the situation. He put his hand on Hernandos shoulder. "We must send her back to Aluna, and then you will take her ashes to Pueblo Viejo," he said tenderly. "You will consult the tribe, and you will know what to do." Hernando then was to return to the village alone, Mamo Jefe explained, for the shaman would need to stay there with the young girl now that Elder Sister could no longer care for her. 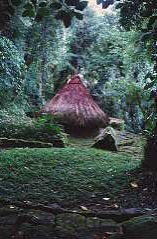 Late that afternoon, Hernando built the pyre outside the cave as Mamo Jefe watched over the remains of the high priestess and conducted the Kogi death ritual in the temple. Emerging from the cave after sunset, Mamo Jefe asked Hernando to help him bring the body outside, and the two men conducted her cremation ceremony in silence, according to the Mamo's tradition. While the fire raged, Kulez had a vision. The spirit of Elder Sister came to him, and she told him to stay with the Kogis and master their ways. Even though it seemed hopeless, for when they found out what he had done they would probably inflict due punishment, he was being guided to approach them when he returned to Pueblo Viejo. Kulez made his way back to the town alone, and went directly to the nuhue. He told the Mamos exactly what had happened, how Elder Sister had been struck and died when he took a photograph of the amazing and powerful crystal. They gasped in shock as he told the story, for it was the first time one of the Younger Brothers from the modern world had learned of their most sacred healing stone. Kulez knew from the BBC documentary that the Kogi trained their holy leaders in a cave from birth, and Mamo Jefe had told him of their tribes dilemma. Since the child was still nearly two years from being of age to take over for Elder Sister, they would need to consult Aluna to find out what to do in the meantime. They told Hernando more of their ancient prophecy about the devastation of the Earth, which explained why the Mamos had in fact sent the BBC away after the documentary was filmed. Afterwards, when the destructive spirits of the outer world began to creep into their society, they actually had cut down the bridge by which those from the world of the Younger Brothers could easily reach their land. They saw the coming destruction of the planet and told him they believed the Younger Brothers, of whom he was one, were going to cause this catastrophe. As they wept, Kulez felt the priests revulsion towards him and his inadvertant, callous act. He quietly and sincerely told them how sorry he was, and humbly asked for their forgiveness. Then he told them he would like to stay there and study their religion. * The priests asked him to leave while they consulted the tu-tuma. When the bubbles spoke, in line with Elder Sister's posthumous plea to Kulez, they said for Hernando to stay. Some priests were in fact disappointed. Their tribe holds a verbal tradition and none of them even writes, and so they told him he must as well give up his cameras and film. At this point Hernando would have done anything they asked in order to stay and atone for his foolish act. And so for the months ahead the tribe simply allowed him to observe. Unable to just sit by and watch, during the days he joined the other men tending the crops in the fields. 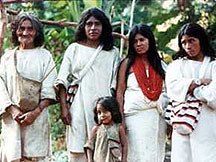 And when the Mamos met each evening in the nuhue, Kulez stayed and cooked with the women and the non-religious vassals. Soon the Kogi noticed Hernando worked harder than any of the other vassals, and it wasn't long before the tu-tuma told the Mamos to invite him to attend their holy meetings. Kulez met with them and studied, and slowly but surely began to recognize the spirit in every object, every plant, every mineral. The highest ritual of the tribe was the Mamos annual pilgrimage to the high temple, from where they journeyed slightly further on to a nearby peak above the Sierra. 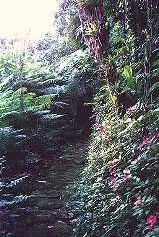 At that secret location, there is a spring from which waters flow into the Amazon valley below. According to their ancient ritual, by placing the potent crystal in the spring, powerful healing energy would bestow health and fertility to the waters that then drain into the populated valleys of Peru, Colombia, and Ecuador. The world once again would be renewed for the coming year ahead with these recuperative qualities. And as the time of year of the secret pilgrimage was approaching, Hernando was amazed to be asked by the Mamos to join them on their journey. Together with the rest of the Mamos, Kulez climbed the Sierra and arrived once again at the temple where Mamo Jefe had stayed on to teach the holy child. In silence, and with a shroud over the childs head, the two left ahead of the pilgrims to go to the spring at the top of the mountains. When they all had arrived, everyone grew still to see how the ceremony would be different this year, without Elder Sister to preside. As he joined the assembled Mamos, Hernando was amazed at the majestic beauty of the sacred place. To everyones surprise, the young girl, who had been trained by Elder Sister about the ritual, removed her veil to look. The holy child pointed almost immediately at Hernando, and asked for him to come to the altar where she and Mamo Jefe were standing. The child led as Mamo Jefe assisted in what was coming through, and the young priestess asked for Hernando also to help with the next part of the ritual. Touched and honored, he followed the girl to the altar where sat the crystal, underneath a woven blanket. She pointed for him to remove its cover. Hernando did exactly as he was asked, and she then passed her hands all around the crystal, just as Elder Sister had taught her always to do when about to touch it. Now she handed Kulez a sacred, woven cloth and asked him to bless and drape it over the sacred object for the ritual. 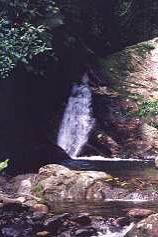 She then motioned Mama Jefe to move the crystal under the waterfall coming out of the spring. 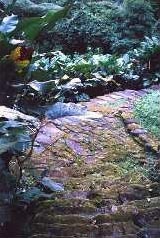 In traditional manner, the potent mineral charged and blessed the Amazon valley below. Once the ceremony ended, and the Mamos had prayed together for the world as they did each year for the highest outcome on Earth, Mamo Jefe and the holy child turned to lead the other Mamos away. Hernando Carlos Kulez wrapped the crystal once again in its cover, and walking with the others, carried it back to the temple in the cave. Later, after the child went in to sleep, Hernando joined the Mamos in their evening ceremony around the campfire. As they chanted, he was in awe of the beautiful ritual and his own participation in it. Then just before midnight, the ground suddenly began to shake. It was an earthquake. Thinking immediately of the child in the cave, Kulez ran inside the temple and yelled to her. As the ground continued to shake, the walls of the temple began to give way. Just in time, he saw her in a small alcove in the back where she'd awoken from her sleep. Without even looking at the glowing crystal that had been returned to its place , he picked up the child and ran for the door. Awakened by the commotion, the child screamed as they reached the entrance, and pointed at the luminescent mineral. In instant response, Hernando passed her to Mamo Jefe, and ran back into the cave for the crystal. This time he picked it up with the nearby sacred cloth and fled again for the entrance. In a flash he remembered the scene from his dream, at the end, when he was holding the crystal. Now that part had also come true. 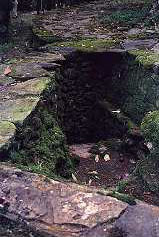 When the ground stopped shaking, the temple cave had been demolished. Yet miraculously the child was saved, and Hernando watched as the Mamos joined hands in a circle to rejoice. He followed, and together they all prayed. From that time, Kulez has never left the Kogis. He stayed in the Sierra with several of the other Mamos to restore the mountain temple. When they finished rebuilding, the wise child came of age to take over as the Kogi tribes new Elder Sister. Read the classic Virgo myth and interpretation, from The Labours of Hercules.